July 14th 2017, The End, Nashville TN: On the west side of Nashville, Tennessee rests one of the city’s most treasured dive bars. The End is a small-scale venue that carters to a variety of promising rock and punk bands. Its regulars appreciate the place with its no-frills, no-flash vibe. The building looks like it hasn’t been updated in over 20 years and that’s the way the devoted attendees like it. Rich with history, the place has become a relic and a home to those in need of some heavy music. The End only sells beer and your shoes might stick to the floor, but it just adds more character to this Nashville staple. Over the years this bar has hosted a lot of legendary bands and this past Friday night was no different. The line wrapped around the small venue with eager fans ready to catch Demon Hunter’s first gig of the year. Originally from Seattle, Washington, Demon Hunter has been a hard working band since their beginning in 2000. This past March they released their eighth studio album, ‘Outlive’, and are gearing up to start touring again. A month ago, the band surprised their fans by announcing an intimate show that would be hosted in Nashville’s favorite dive bar. 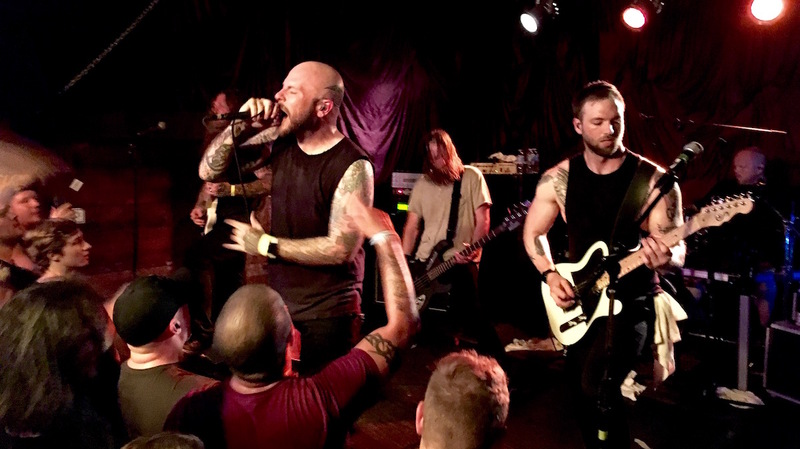 The show sold out in a day and Demon Hunter was gracious enough to add an extra performance later that same night. Even at 10:30 PM on Friday night, Nashville’s humidity was so thick you could have cut it with a knife. The heat and sizzle of the evening added to the excitement felt by everyone in line. When the doors opened, the small room buzzed with anticipation as DH’s fans waited for their boys to start their second show of the evening. Before the music even began, sweat started to trickle, but the heat didn’t seem to hinder the antsy audience. Everyone huddled close to make the masses fit in the pocket-sized room. Right before 11 PM, the track for their song ‘Trying Times’ was cranked. A wave of excitement washed over the room as Demon Hunter took the stage. Singer Ryan Clark’s voice rang and resonated as he vocalized the moving words from the number off of their newest release. The sound quality was impressive, each instrument sounded crisp and distinct. Yogi Watt’s snare to Jeremiah Scott’s guitar tone, everything was on point. Without slowing down, the band ripped right into ‘Cross to Bear’, a crowd favorite. Guitarist Patrick Judge shared vocal duties on several numbers, and gave each song an even fuller, more dynamic sound. The band mentioned after their snug show, they’d be heading north to play Chicago Open Air. Ryan reassured the crowd that they meant just as much to him as the bigger festival audiences. He bolstered his fans by saying, “This is more my style, dirty and sweaty.” The fans were delighted to hear such a variety from the band’s discography including two tracks off of their album ‘Summer of Darkness’, making the evening feel unique and special. They whipped out several songs they rarely play live and the appreciation from the fans was limitless. Each number flowed right into the next with a level of unmatched intensity and enthusiasm. With a midnight curfew, the band only had one short hour to play, yet that didn’t stop them from going over. Their encore included ‘I Am A Stone’, a B-side track off of their album ‘True Defiance’. Demon Hunter is well known for their melodic heaviness and their soul searching lyrics. So the crowd got lost in the sweet, simple sound of the acoustic piece, leaving every heart touched. From deep, severe songs to their stoic, acoustic numbers, the band knows how to be serious, but fun and heavy all at the same time. It’s always inspiring to see a group of guys love what they do and love the people who love them. They clearly missed playing live and they sounded better than ever. It will be exciting to see what they have in store next.